The project is inspired by a short story written in 2004 by Patrick Bernier and entitled ‘A Tale for Creating a Legal Precedent’ in which a migrant woman defends her right to remain in France as co-author, tutor and artist of a work of art immaterial. 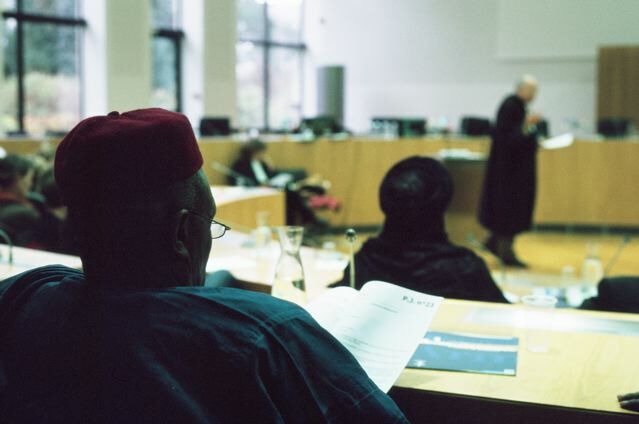 Based on this tale, two lawyers Sebastien Canevet and Sylvia Preuss-Laussinotte, specialising in intellectual property and immigrant rights, have developed a performance in which they are the defenders of an undocumented migrant, who is the bearer of an intangible art work made with the collaboration of a European artist. Considering that French and EU lawmakers are constantly restricting immigrants’ rights on the one hand, and zealously expanding the domain of copyright on the other hand, Bernier and Martin set out to make their fictional scenario a template for real social action. Propose a new model for dealing with the EU’s legal restrictions on immigrant rights.